Two fingers: With two fingers you can drag to scroll up and down a page, pinch to zoom in and out, and rotate an image by circling two fingertips. Tapping with two fingers can also be used in place of the right-click. Three fingers: If you swipe with three fingers, you can flip through images in the iPhoto library. Four fingers: An upward swipe, using four fingers reveals the desktop. A downward swipe reveals all open windows. Swiping to the left or right allows you to switch between open applications. 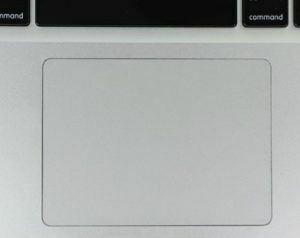 The MacBook Air also supports all the Multi-Touch gestures, but, unlike the MacBook Pro, it features a one-button trackpad. Tap to click: Tap with one finger to click. Secondary click: Click or tap with two fingers to perform the equivalent of control-click or right-click. Within the Trackpad Preferences panel you can also choose an option to hold down a specific key, whilst sliding two fingers to zoom in on your screen pointer. Smart zoom: You can double-tap with two fingers to zoom in and back out of a webpage or PDF. To zoom in or out, pinch with two fingers. To rotate a photo or other item, just move two fingers around each other. To swipe between pages, swipe left or right with two fingers to show the previous or next page. To scroll, slide two fingers up or down. Note that you can turn off trackpad scrolling in Accessibility preferences: Go to Apple menu > System Preferences. Once there, click Accessibility. In the Mouse & Trackpad section, click Trackpad Options and deselect the Scrolling checkbox. To open and show the Notification Center, swipe left from the right edge with two fingers. You can use three fingers to drag items on your screen, then click or tap to drop. You can turn on this feature in Accessibility preferences. Also note that Accessibility preferences has options for one-finger dragging: Go to Apple menu > System Preferences, then click Accessibility. In the Mouse & Trackpad section, click Trackpad Options. Select Enable dragging, then choose one of the drag lock options from the pop-up menu. Click the question-mark button to learn more about each option. You can tap with three fingers to look up a word or take other actions with dates, addresses, phone numbers, and other data. To show the desktop, just spread your thumb and three fingers apart. To display the Launchpad, pinch your thumb and three fingers together. To open Mission Control, swipe up with four fingers. Note that in some versions of macOS, this gesture uses three fingers instead of four. App Exposé: Swipe down with four fingers to see all windows of the app you’re using. Note that in some versions of macOS, this gesture uses three fingers instead of four. To swipe between full-screen apps: Swipe left or right with four fingers to move between desktops and full-screen apps. Note that in some versions of macOS, this gesture uses three fingers instead of four. You can configure a specific area of the trackpad to act as the right-click trigger when tapped with a single finger. Look for the option under System Preferences – Trackpad. For a secondary click, click the right side of the mouse. To scroll, slide one finger up or down. To smart zoom, double-tap with one finger to zoom in and back out of a webpage or PDF. To open Mission Control, double-tap with two fingers. To swipe between full-screen apps, swipe left or right with two fingers. To swipe between pages, swipe left or right with one finger to show the previous or next page. Check for updates to install and run the latest version of the operating system, the latest firmware, or the latest drivers. To see if any updates are available for your trackpad, open the App Store, then click on the Updates tab at the top of the window. Check your settings as the issue can be fixed by simply tweaking a couple of options. For example, if your trackpad seems fully functional with the exception of its ability to double click, it is possible that the time delay for your system to recognize the gesture has been set too low. If your trackpad is completely unresponsive, your system may be set up to ignore the trackpad input when a mouse is detected. As long as you’re running OS X 10.7 Mountain Lion or later, you can change the setting by heading to System Preferences > Accessibility > Mouse & Trackpad. Untick the checkbox next to “Ignore built-in trackpad when mouse or wireless trackpad is present”..
We are just eager to buy your old computer from you if you feel like exploring next generation Apple computers and gadgets and pool money for them. We offer the best prices online for your old electronics: Used electronics on sale, check our prices now. Using trackpad is easier than you may think, but anyway thank you for some amazing tips. I suppose the Trackpad on another Mac works in the same way.